Boy band BTS, the biggest of the K-Pop acts, have made ARIA chart history. Three singles – ‘DNA’, ‘Fake Love’ and ‘Mic Drop’ ft. Desiigner (Steve Aoki Remix) – have been certified Gold in Australia for combined digital, physical and streaming sales of over 100,000. They’re the first of the K-Pop acts to do so down under, and are expected to generate more such success if rumours prove true that they are touring Australia again after sell-out visits in 2015 and 2017. Since their last Australian visit, BTS’s popularity in the west has soared into the stratosphere, pinpointing the whole US$5 billion K-Pop scene. 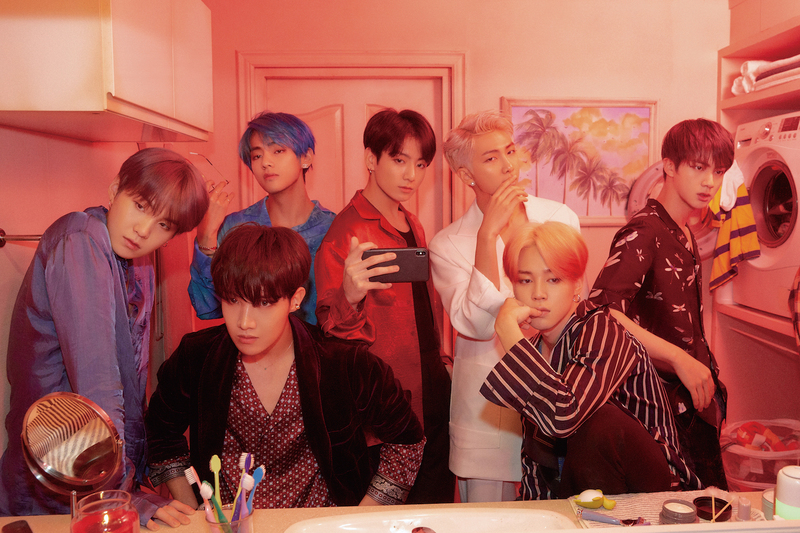 The seven-piece new album Map of the Soul: Persona had advance orders of 3 million. Love Yourself: Answer shifted 2.5 million while their documentary series was watched by well over 25 million globally. Over the weekend, YouTube confirmed that the act’s new video for ‘Boy With Luv’ ft. Halsey was the most viewed 24-hour debut in the platform’s history with 113 million clicks. This came on the heels of BTS becoming the first Asian artist to exceed 5 billion streams on Spotify. The first stars of K-Pop from the mid-90s, Rain, Girls’ Generation and Big failed to make an impression outside Northern Asia. But the current crop made the translation, not just through catchy songs, strong colourful images and synchronised dancing. From the get-go, there was a deliberate global vision with expert use of social media, an edge to their image, and contemporary millennium stories including depression, social activism and bullying that are empathetic enough to be discussed en masse on social media and podcasts. They came at a time when streaming tore up the rule books, where an act that sings and speaks mostly in an Asian language (only one BTS member can chat in fluent English) can make a huge impact in the west and top the US charts. Time magazine has hailed BTS as “next generation leaders” in a front cover feature back in October 2018. Touring Australia in June are BLACKPINK and Monsta X.
BLACKPINK, whose Australian shows have sold out, became the first K-Pop group to reach 750 million YouTube views, and hailed as the second major global K-Pop breakthrough. Jeff Benjamin, Billboard’s K-pop columnist, told TMN, “K-Pop truly is a music scene that works best in today’s digitally focused, A.D.D. generation. “K-Pop artists do not have long leadups to new albums but instead typically choose to deliver the lead single, the music video and full album all on the same day with the first live performance coming within 24 hours of release. “They also tend to drop multiple albums throughout the year. “They keep the excitement and interest high with no chance of people getting bored, but instead delivering all they can and hoping for longevity. “K-pop artists have always done a great job at delivering a full scope of pop entertainment as well: the songs touch on lots of different genres, every group is crafted so there are singers, rappers and dancers, and the artist’s image and look get refreshed with every release. Australia has always been seen by Asian promoters as a market which quickly adopts new fads. As a result, from 2011, acts like G-Dragon and Jay Park would tour, to strong enthusiastic student crowds. Canberra-based Joe Lee, one of the first Australian-based K-Pop and Mando-Pop record producers and promoters says, “This kind of music was always going to take hold of in Australia, initially because of the large Chinese and Korean student population. The international K-Pop festival and convention KCON would pack out Melbourne’s Federation Square. The Academy in Sydney held K-Pop boot camps to train wannabes on becoming a star. About a dozen who were born or grew up in Australia moved to northern Asia and joined K-Pop troupes. The most successful has been Rose of BLACKPINK, who was born in Auckland and grew up in the Melbourne suburb of Box Hill. Others included Stray Kids’ Bang Chan, Led Apple’ Hanbyul, EVOL’s Hayana, ZE:A’s Kevin, C-CLOWN’s Rome and JJCC’s Prince Mak. BTS and BLACKPINK could break into the Australian mainstream, for the same reasons why they’ve become household names in the US, Europe, the Middle East and Brazil. Lee is certain that Australia will be a mass crossover market. But a question mark remains: for how long? But for the time being, it’s a scene that will continue to be fuelled by streaming and its importance to its following. Benjamin also points out that K-Pop’s massive growth outside Northern Asia “show actual fans and participants ready and willing to spend money to bring K-Pop to their home countries” —that’s very different than being at home watching a YouTube video.